Household trash compactors represent a crucial point in the history of Americans’ relationship with the things they throw away. 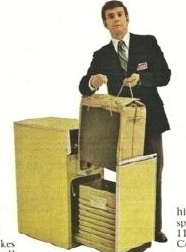 Invented in 1969 to crush the bulky packaging and other disposable products , the compactor never became a household necessity, contrary to its manufacturers’ hopes. Looking at the compactor’s biography, including its failure as a household appliance, reveals many late-twentieth-century American anxieties, values and attitudes surrounding the act and idea of disposal. 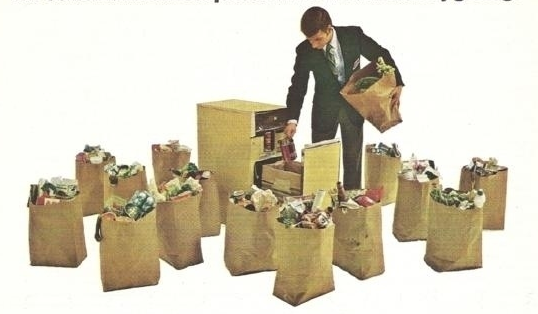 “Trash Compactors.” Consumer Reports, June 1, 1973. Pg. 390. Put succinctly, this is the conundrum of the trash compactor. It ostensibly worked to fix a problem: the increasing amount of household trash the American people had to contend with. But what trash problem could be fixed in a process that failed to reduce the actual amount of refuse and increased the weight per bag significantly? When and why it failed as a consumer product. The trash compactor, even from within the house, participated in a network of municipal, state, and federal systems of solid waste management, tying the private to the public and the personal to the political. To the consumers of the appliance, predominately upper-middle-class white homeowners, the trash compactor was important in the late twentieth century process of ‘distancing’ Americans from the unsightly consequences of their own consumption, both mentally and spatially.